Bos Wars Game Review - Download and Play Free Version! Lots of maps to compete on. Large number of ground and air units to build. You can speed up or slow down gameplay to suit your level of play. Only one faction to play. Campaign missions are very difficult. You are the last remaining free leader and it now falls upon your shoulders to command your forces and achieve victory. Begin by defending your small outpost in a critical battle against Captain Szarin and lead your war-weary troops to stop him at all costs. Build up your base, train an army, and wipe the enemy from the field. Move onward to defeat Captain Fizzpot and defend against the vicious Commander Fzedhia as they try to restore their dictatorship. Watch the story unfold as you fight ever greater battles and strive for victory in this real time strategy game. Bos Wars keeps things rather simple and easy to use with classic RTS elements that any fan of the genre will instantly recognize. You can either play a random 'skirmish' style map where you set conditions, and computer opponents, and see who will be the last standing, or you can explore an expansive campaign. Search the field quickly since the game map has a 'fog of war' which darkens anything outside of your units field of view, making it very important that you monitor the enemy as much as possible. There is no research component in the game, so it is only a matter of building manufacturing facilities and collecting resources in order to get your units onto the field. Also, all players have the same buildings and units so obtaining resources is key. This game handles resources in a slightly different manner than other RTS titles. There are two resources, magma and energy, which can be collected by harvesting trees and rocks or building power plants and magma pumps over hot spots. The buildings collect these resources at a continuous rate and this greatly affects your unit production ability. Though the actual units and controls are quite simple, the planning and resource management you'll need to conduct greatly adds to the gameplay. There is no real unit cap to speak of, but the amount of resources which you can hold depends on the number of vaults, or command bases, which you have. The resource collecting and unit production affects your treasury at a continuous rate, so if you are bringing in the same amount of materials which are being used to produce units and structures, then your reserves are not affected. This flow between using up or bolstering your reserves greatly affects the gameplay since you can produce a greater amount of units in a short period of time if you have enough built up in your reserves, but your production rate greatly slows down when you have to wait for your harvesters to bring in the much needed resources. You'll have to find just the right mix for each battle if you have any hope of survival. 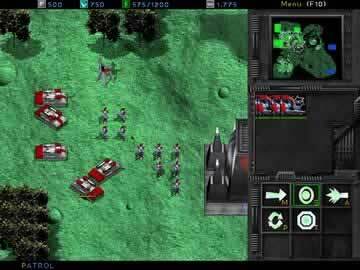 So if you like classic RTS experiences with some intriguing gameplay twists, then download Bos Wars today absolutely free! The fate of the world is in your hands as you battle for control. Bos Wars places you in charge of building your base, gathering resources and obliterating the enemy. This futuristic real time strategy (RTS) game has plenty of troops and maps to keep you busy for hours. With multiplayer, campaign and custom maps, you won't soon run out of things to do. Bos Wars is played like most RTS games. You can play single maps against the computer, Campaign missions that follow a storyline, play online or LAN against friends. In the quick play single maps you get to choose all the options. You can choose the difficulty, how much resources you start with, and even the map. The campaign missions start with a tutorial that gets you familiarized with the various controls and how to gather resources. All the basics are covered in the tutorial. The missions in the campaign mode vary from trying to sneak across the map to the standard, build a base and eliminate the competition. There are tons of options for building in Bos Wars. Buildings come in three categories: basic, unit and defensive. Basic buildings include power plants and vaults. Power plants are used for harvesting energy, while vaults are used for storing resources and training engineers who do the building and gathering. Unit buildings are used to construct the various types of war and transport units you will need. Buildings like the training camp and aircraft factory allow you to produce fighting units. All the construction requires two resources, magma and energy. These two resources can each be harvested in two ways. Manual harvesting is done by engineers (magma is harvested from rocks while energy is harvested from trees). The other option is to build buildings that generate resources. Power plants generate energy, and magma can be harvested from hot spots by placing a magma pump on top. A display at the top of the screen will tell you how fast you are generating resources and also how fast you are using resources. Another bonus this game offers is a map editor. You have the ability to create your own maps and set up whatever scenarios you want. The graphics aren't the best in this game but don't detract from it either. 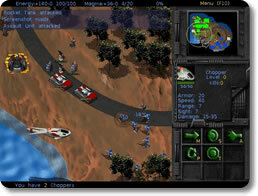 The graphics and art are very similar to the “Command and Conquer: Red Alert” and other such early RTS games. Each unit is clearly distinguishable from another by color and shape. The sound effects work well with the game and add to the battle. The tanks and guns all sound appropriate and make it seem like there is really a battle going on. There are only a few drawbacks to this game. First, there is only one faction to play. You can change the color you are, but other than that everything remains the same. All teams will be building the same units. The next thing is the campaign missions, they can be excruciatingly hard. The first mission has you try to sneak across the map that is littered with gun turrets. Since you have no way to detect them, the only way to find them is when you come across them. Most of the time that is instant death. With plenty of units and base defense to build, you can play however you want. The campaign is very challenging, but will give you something to shoot for. Creating your own maps will allow you to be as creative with games as you want. A tutorial at the beginning will teach anyone who wants to play. All this combined makes a great game that you will get hours of enjoyment out of. With this being a free download this is more than worth the download.